Mount Rushmore is famous for the sculptures of four former United States' presidents carved into the granite. The sculptures are known as the Mount Rushmore National Memorandum and represnts 130 years of United States history. 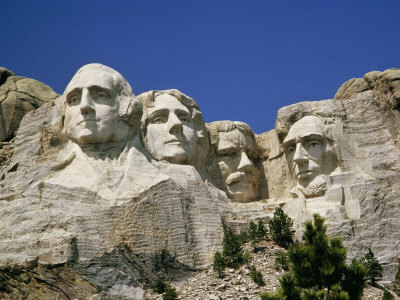 From the left the presidents are George Washington, Thomas Jefferson, Theodore Rooseveldt and Abraham Lincoln. They are about 18 meters tall. Every year almost 15 million people come to see them.